Hi, it’s Steve here. I’m Sandy’s husband and she’s asked me to write an article on the best baby carriers for Dads. 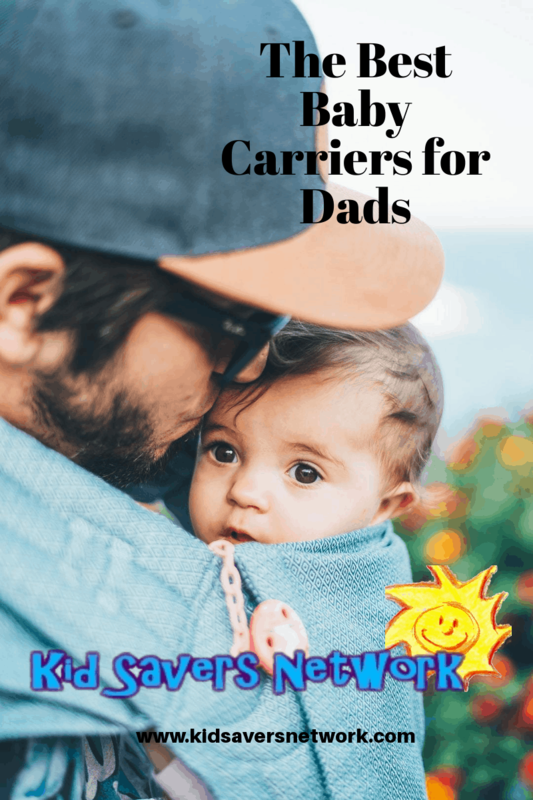 So, this article will discuss some of the carriers I have used and tips for Dads choosing a carrier. 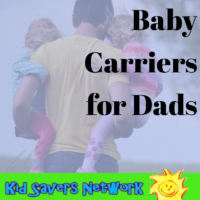 Pre-Toddler Carriers (6 – 12 months). 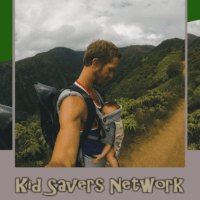 Unisex Baby Carriers – Yes or No! We originally bought a carrier because it seemed to be the done thing. 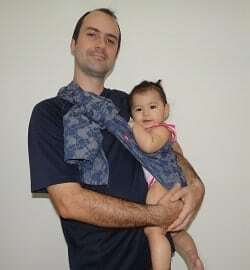 Little did I know that using a baby carrier (a.k.a “a baby sling”) has given me many special moments and great memories. I think the reason for this is I was waiting for my time to “connect” with our little ones. I’d hover in the background, a not-so-innocent bystander waiting to either be of use or not feel so awkward. Whenever I held my first-born he would be comfortable for all of about three seconds. Then he would scream his head off! Once that fear passed (and buying a good baby carrier helps with this!) I began to enjoy and eventually love it. When researching this article I saw a forum post around Dad Carriers. It said, “Use your arms!”. Whoever wrote that has never had to hold a squirming toddler and root around for change at the checkout before. Or actually goes outside and tackles things like steps, crowds and the occasional mountain! I could write how good this is all day long! No need to clear my trunk out before going out on family trips. No need to set up a perimeter around the car while you’re trying to unfold the stroller (so tight parking spaces are out) – or worry about the toddler running off in the mean time…. No stroller = More Fun! 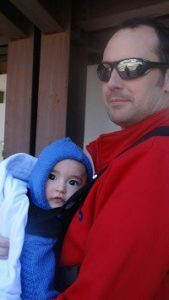 If you like going hiking, to the zoo, Farmers Markets or anywhere which has steps and / or people in close proximity a baby carrier can let you do it all again. 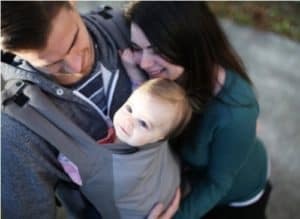 Once you get your baby wearing technique down, you can leave the house and car a lot, lot quicker. You also don’t have to dawdle like with a stroller, and can actually walk at a decent pace again! I really hate waiting for an escalator with a stroller. I was stuck waiting at one busy mall for what seemed eons as it was a weekend and every single one had no space. With a carrier or ring sling, you can take the escalator or stairs instead. I’m really luck to have a partner who goes above and beyond with the kids. 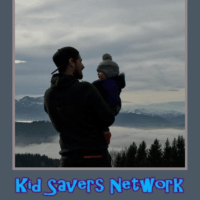 I’d like to do more – if the kids would just let me! Fortunately, they like being in the carrier as much as I like wearing it. Most Dads know that putting a baby in a car and driving around will (eventually) send them off to sleep. Well, baby carrier are just as soothing! I think the walking motion and being able to hear a heartbeat simulates being in the womb. My personal favorite. I absolutely love the time I got to spend with my son and now my daughter outside. Having them so close to me while we go out and enjoy nature, or simply run some errands is an indescribable feeling. I’ll preface this part by saying I’m no baby expert. What has worked for me might not work for you and your little one. The best baby carrier for you will also depend on how old your child is. That’s why personally I recommend carriers with generous weight limits that can be used in a variety positions (ie “4-in1”). I found ring-slings and front pouches worked best during this stage. The ones with stretchy fabric are great as you can really secure them firmly to your torso. Yes, you can get Ergos and Baby Bjorns that state “Newborn”, but you also need to buy an extra newborn insert. And even then, a baby at 7lbs (the stated minimum weight) is not held securely enough for my liking as there’s too much space. Babypeta have a great newborn wrap and it’s Unisex. So this will be a good choice for Dad’s who are looking to save a bit of money. And on something that can only be used for a few months that’s a good idea! The Babypeta wrap is pretty long at 4.7 meters and just stretch enough to provide great support to a newborn’s head. Following the instructions, it only took a few seconds to secure baby to my body. Baby K’Tan is a popular choice among Dads. I’ve seen them described as a “Wrap for Dummies”. This is unfair and misses the point. If you’re in the market for something a bit more manly, the Camo Version of the Babyhawk Mei Tai is just the ticket! It’s got a good amount of padding on the shoulder, so even if you’re an XL shirt size it won’t dig in there (as many of these carriers do). Not only does that keep things more hygienic but it’ll also keep the re-sale value high. Or make a better gift when you’re done! I called this stage “Pre-toddler”. It’s about the time they can sit, crawl and before they walk (which varies in many babies). In the picture with my daughter, you can see I’m wearing a Mamaway Ring Sling. It’s o.k, I suspect it might not be the best ring sling out there as it can be a bit fiddly. The big advantages for me were the price and the fact you can use it for a couple of years. For my wife, it makes a great nursing cover, too. 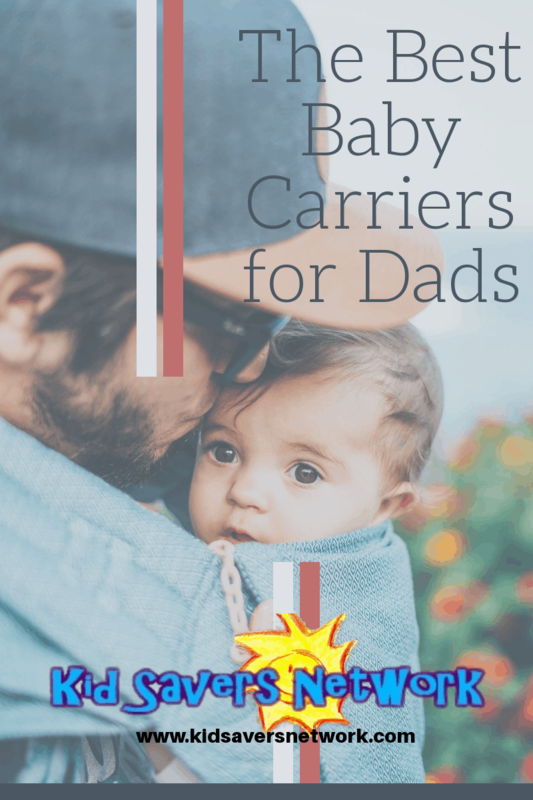 If you’ve got the money (or looking to get a great gift) and are looking more for a carrier per se, the Ergo 360 is popular among Dads. Fair disclosure – I only tried this one on in a store but boy did I like it! (I just couldn’t afford it). The Ergo 360 can be used in 4 positions (front facing & rear facing, back, and hip). There was a lot of hoo-ha a few years back about baby carriers damaging a baby’s hips and causing hip dysplasia. This was because of the way a baby would sort of hang there. Ergo claim the “360” “Frog Legs” design carries a baby in the most ergonomically correct position. Is it enough to justify the high price? I don’t know! Here’s a video Baby Bjorn put out. In it, a prominent pediatrician at one of American’s best children hospitals discusses baby carriers and hip dysplasia. When this stage comes round, your baby is communicating with you and more aware of the wider world. There also a damn sight heavier! Because of this, carrying them on your back is a great idea. One tip I found that works well is to put a mirror on a stick (the sort the bomb squad uses) so you can talk to each other and check things are going o.k. Of course, if you’re going to places like the zoo or the grocery store, a front facing baby carrier is what you’ll need. It’s likely you’ll stop and look at things together, so it’s not that awkward. My tip is to find a baby carrier which provides good support for both forward facing and rear facing carry. I’ve already mentioned Ergo, so I guess I should balance things out by mentioning the “Other” heavyweight of the baby carrier world – Baby Bjorn. The fact is they do make a high-quality toddler carrier which is perfect for back carrying. As mentioned with the Ergo 360, the carrier has also been given the “All Clear” in the hip department, too. Personally, when I was researching and buying baby carriers, the thing I was most scared of was dropping my precious cargo. I was prepared to spend a little bit extra to ensure the buckles, clasps, straps and ties all did their job. If you shop around and check Amazon you might be able to get a bargain. The important thing to remember is the more expensive baby carriers can be used up until aged 3. A lot of the cheaper ones are only up to 25lbs. If you have a boy this will be a problem. My son passed this weight around his 2nd birthday and I’ve had other parents (who I now hate btw) call him “Too Skinny”. Now we’ve got to the stage where carrying your toddler becomes a workout in itself. You need to take breathers every now and then – when your partner’s not looking of course! This is where back carrying comes into its own. 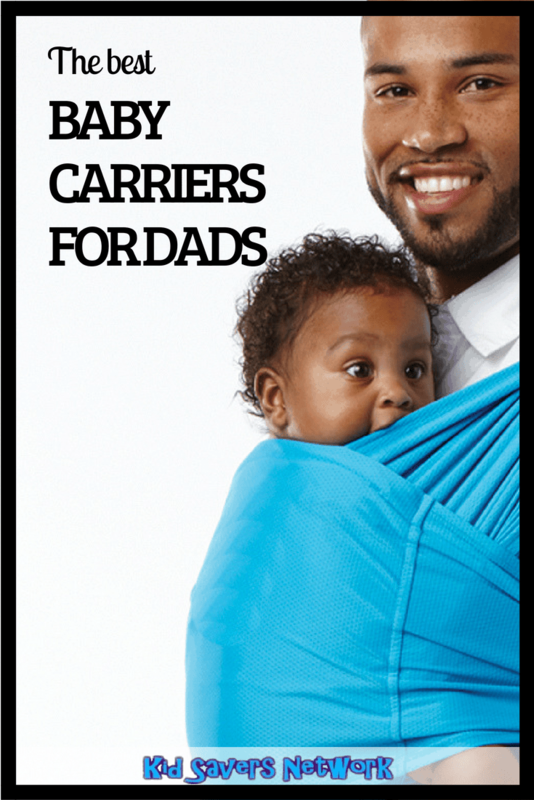 Look for carriers that have a generous amount of padding and are soft for both you and your baby. I’ve already mentioned the Ergo 360 and Baby Bjorn which are good up until 3 years old. Whatever you buy, remember to check the maximum weight limit and read reviews around how good the securing mechanism is. 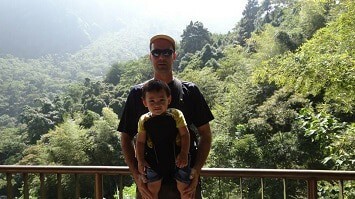 Another baby carrier for dads that meets these requirements is the Boba 4G. It’s pricey, but unlike the Babybjorn and the Ergo the infant insert is included. So you could use it from newborn. The Boba also adjusts better than the other carriers. There are two adjustment points on the waist and shoulders so it’ll fit you better if you’re a larger guy. The ability to adjust well also makes things more comfortable for you and your baby as the weight is distributed better. It also means you can share it with your partner and adjust it to your body frame. There are 9 colors to choose from, and “Dad Friendly” ones include the “Slate” and “4G Montenegro”. However, from experience of sharing a baby carrier with straps and buckles, I would say “No!”. There’s just under a foot difference between me and my beloved. So I have to mak lot of adjustments before my little passenger is put in. Often outside, in the hot sun, with a crying baby after a long car journey! One final reflection. I’ve been blessed with two children and “Sling Time” was something I was looking forward to since my second one arrived. The reason was the first time was so unexpected, and sadly so fleeting! I miss taking my son out when he was small enough to snuggle on my chest and fall asleep. Whatever baby carrier you choose Dad, enjoy these times as there’s nothing better. And check out this Dad taking baby carriers to the next level!